Bridging Historias: Funded by the NEH, Bridging Historias addresses the increasingly influential body of scholarship on the importance of Latino/a culture in American history, that remains under-represented in most college history textbooks and teaching collections. The website contains the research and teaching materials used by 42 community college faculty and administrators in the greater New York City region, including scholarly talks and teaching presentations by visiting lecturers. The website is designed to provide scholarly resources for incorporating Latino history and culture into the humanities classroom, and for the general public. EDSITEment! National Hispanic Heritage Month: Explore the history of Hispanic culture in America through EDSITEment, funded by the National Endowment for the Humanities (NEH). This website offers a treasure trove of high-quality material in the subject areas of literature and language arts, foreign languages, art and culture, and history and social studies. LATINO AMERICANS Documentary: LATINO AMERICANS is a landmark six-hour documentary featuring interviews with nearly 100 Latinos and more than 500 years of History. It is a production of WETA Washington, DC; Bosch and Co., Inc.; and Latino Public Broadcasting (LPB); in association with Independent Television Service (ITVS). The LATINO AMERICANS website offers complete episode descriptions, videos of the full series as well as clips that highlight areas of interest, and access to supporting lesson plans and activities. Films are available in English and Spanish. Latino Americans: 500 Years of History Final Report: Latino Americans: 500 Years of History, produced by the National Endowment for the Humanities (NEH) and ALA, was a nationwide public programming initiative that supported the exploration of the rich and varied history and experiences of Latinos. More than 200 grantees around the country — libraries, museums, state humanities councils and other nonprofits selected through a competitive application process — received funding, resources and support to host festivals, collect oral histories, facilitate discussions and hold other public events. Be inspired by their accomplishments in the project’s final report. Latina/o Diaspora in the Americas Project: The Latina/o Diaspora in the Americas Project (LDAP), newly founded in 2014, is a growing archive of more than 100 oral histories dedicated to creating space for Latina/os to share their historical experiences related to identity, immigration reform, labor conditions, education, and civil rights. The site includes tutorials for beginning a new project, deeds of gift examples, and other tools for implementing oral history projects. The Latino Intersections Resource Center: The Latino Intersections Resource Center, a part of the Latino Journal Intersections website, is affiliated with the Department of Spanish and Portuguese, and the Latin American, Latino & Caribbean Studies Program at Dartmouth College, Hanover, New Hampshire. It receives funding and support from the Dartmouth College Library System. The Resource Center’s mission is to create a gateway to resources that facilitate access to Internet-based information to, from, or about the Latino community in the United States. 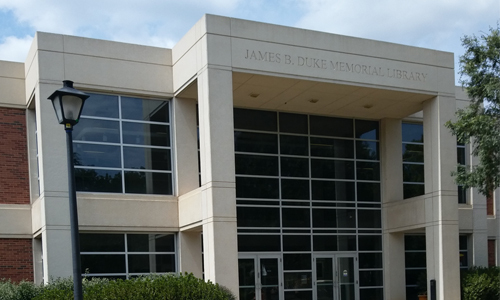 The James B. Duke Memorial Library has a number of resources accessible through our library catalog and research guides to support our Metropolitan College’s English As Second Language Certification Program. There are several ways to support and celebrate National Hispanic Heritage Month on campus and in the Charlotte community. The Charlotte Mecklenburg Public Library has a series of Hispanic Heritage events and programs throughout the month (September 15 – October 15), some of which are: “Arts & Science Council Culture Blocks: Carolinas Latin Dance” at Independence Regional on September 16, and “Traveling Through Latin America with Music” at Myers Park on September 19. Take part in the local Hispanic Heritage Month activities and learn more about the contributions that Hispanic people have made to this great nation and our local communities.